Traditional Crosshead Radiator Valves - Only £23.99! In stock now for just £23.99 including VAT! Hurry while stocks last! Designed to compliment any radiator or heated towel rail in our range, these minimalist pairs of traditional cross headed radiator valves feature a high quality chrome finish, for added durability and luxury style. Add these minimalist valves to contemporary or more traditional towel rails and bathroom radiators for a stunning, coordinated, designer look. With a traditional design and hard-wearing chrome finish, these valves create a high-end look at an affordable price. These superb radiator valves combine stylish traditional looks with unbeatable quality. This high quality pair of matching Traditional Crosshead Radiator Valves is available at an amazingly low price from VIP Bathrooms. Designed to complement our range of heated towel rails, they are beautifully engineered to integrate into any traditional or minimalist bathroom. Sleek design and functionality mean our heated towel rail and radiator valves meet the needs of any bathroom setting. Perfect for use with your new radiator or heated towel rail, this set of valves is designed to control water flow in to your appliance. Supplied complete with a superb 5 year guarantee for total peace of mind, you can be assured that you are receiving an item of the highest quality. The quality of our range of radiator valves is guaranteed. During installation extra care must be taken to avoid damaging the fittings. We provide a 5 year guarantee against faulty workmanship or materials (excluding serviceable parts), providing they have been installed, cared for and used in accordance any instructions supplied. This fine pair of radiator valves is built to the very highest standard, making faults incredibly rare. In the extremely unlikely event of a fault, we will provide a replacement ASAP with the minimum of hassle. This guarantee is designed to be a hallmark of the quality of these valves, but also to provide maximum peace of mind. 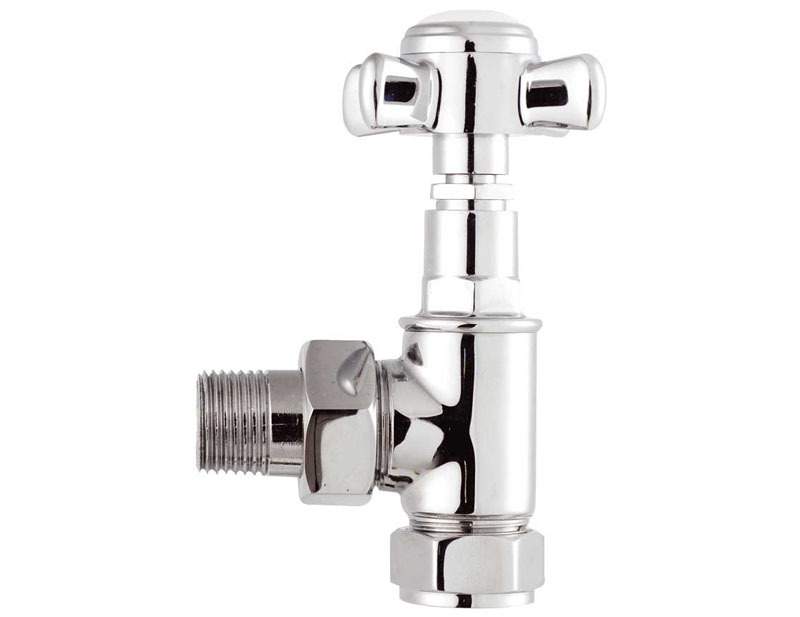 These Traditional Crosshead Radiator Valves are available as an Angled Pair only.